We're an active church fellowship in Chandler's Ford seeking to follow Jesus and make Him known in our neighbourhood. This site will tell you more but if you can't find the information you're after or have any questions then please get in touch. 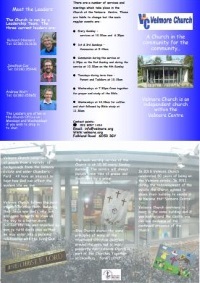 Velmore Church is part of Churches Together in Chandler's Ford (CTCF) which connects many of the traditional Christian churches in the local area of Chandler's Ford, Hiltingbury and Valley Park. We also belong to Partnership, a support network to encourage and strengthen local churches around the UK.